'Potato Pete' was a cartoon character from the WW2 era, whose job was to persuade people to fill up on homegrown potatoes rather than bread made from imported wheat. Potatoes made it into all kinds of recipes during the war, replacing some of the fat in pastry and evening turning into dessert. The Ministry of Food published the Potato Pete Recipe Book, which you can read online. 1. Heat the oil in a saucepan then fry the leeks, celery and onion over a gentle heat for 5 minutes. Add the diced potatoes and thyme then fry for a further 5 minutes. 2. Stir in the stock and bring to a gentle simmer. 3. Cover and cook for 30 minutes until the vegetables are soft then blend until smooth. Loosen with a little more stock if too thick. Season with salt and pepper. 4. Serve in warm bowls with a sprinkling of chopped parsley. 1. Heat the olive oil in a frying pan then dip the beef into well-seasoned flour. Fry in the frying pan until golden brown all over then set to one side. 2. Slice the apple, onion, potatoes and tomatoes. 3. 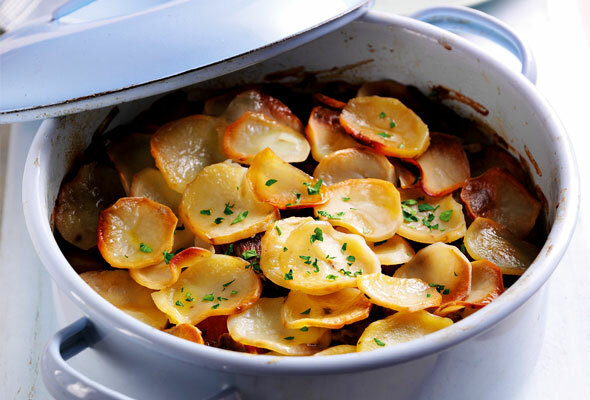 Arrange a layer of sliced potatoes in the bottom of a casserole dish. Cover with beef then with the mixed vegetable and apple slices then sprinkle with a little rosemary. 4. Repeat layers, finishing with potato. 5. Pour over the stock then cover with a lid and bake in a preheated oven at 180C / 160C fan / gas mark 4 for 2 ½ hrs and serve with green vegetables. 1. Cut a core out of the centre of each potato and stuff the sausage meat in its place. 2. Bake in the oven at 200C / 180C fan / gas mark 6 for about 1 hour. 3. 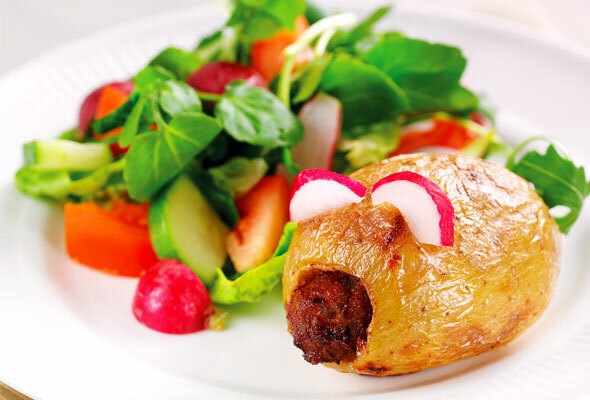 When the potatoes are cooked remove from the oven and serve with salad. 1. Pre heat the oven to 200C / 180C fan / gas mark 6 and bake the potatoes in their jackets for about 1 hour until tender in the centre. 2. Make the white sauce by melting the butter in a saucepan then stir in the flour. Cook for 1 minute then gradually whisk in the milk. Once all the milk is added keep stirring and bring everything to the boil. Simmer for 1 minute then remove from the heat and stir in the cheese and parsley, then season with salt and pepper. Cover the surface with cling film to prevent a skin from forming. 3. When the potatoes are cooked cut in half then scoop out the centres and roughly mash, setting the skins to one side on a baking tray. 4. Add ½ of the white sauce to the mashed potato and mix. Spoon the potato mix back into the potato skins. 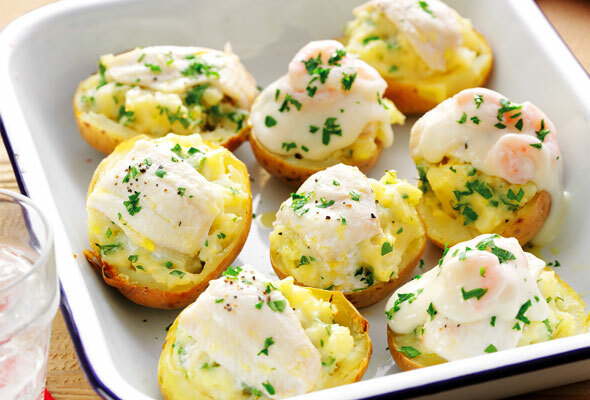 Cover the top of each potato with a strip of sole, season then place back in the oven for 10 minutes or until the fish is cooked. 5. Mix together the remaining white sauce and prawns and loosen if necessary with a little more milk. 6. Remove the potatoes from the oven, pour over a little of the prawn sauce and scatter with the remaining parsley. 1. For the filling, heat the olive oil in a large saucepan then add the vegetables and fry over a medium heat until lightly golden brown for about 10 minutes. Stir in the garlic and cook for 1 minute then stir in the oatmeal and pour in the stock and cover with a lid. Simmer gently for 10 minutes until tender, stirring every minute to prevent the vegetables from catching on the bottom of the pan. 2. Once the vegetables are tender remove from the heat and stir in the parsley. Season well with salt and pepper. 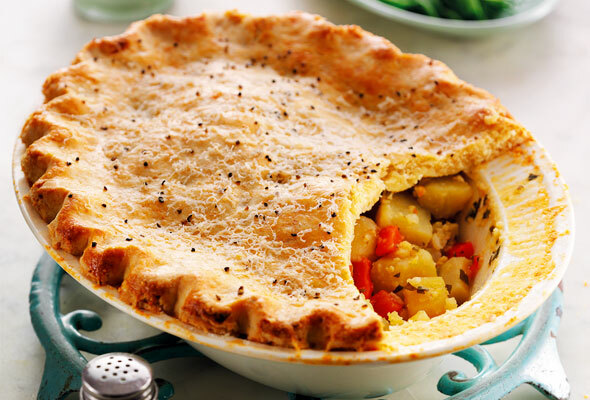 Spoon the vegetables into a deep pie dish and make the crust. 3. For the crust, combine salt, flour and baking powder then rub shortening into the flour mixture. Gently mix in the potato then add a little milk if needed to create desired consistency, then knead. 4. Roll out the crust onto a floured board then place on top of the vegetable mixture, crimpling the edges. 5. Brush the top with egg then sprinkle with a little black pepper and Parmesan. Bake in a preheated oven set at 220C / 200C fan / gas mark 7 for 25-30 minutes or until the pastry is lightly browned then serve with gravy.